Is a wedding in Dubrovnik the right place for the most important decision of your life? Have you ever thought about a romantic and particular setting for this most special day like getting married? If you are looking for the best wedding destinations with two most important features, romance and style, than Dubrovnik is a destination that meets your dreams. Dubrovnik is unique wedding destination that offers you the complete package covering all the aspects to make your wedding day memorable and splendid. After all it is one occasion that is going to happen once in a lifetime. So make it as special as can be. Dubrovnik is a witness of many brides and grooms who every year decide to say “yes” in this fairy-tale town. Is there a more beautiful scenery of ancient churches, stone paved streets, picturesque sunset, Dubrovnik’s churches bell sounds, elegant hotels, mighty walls and fortresses or islands? The single most important thing for couples after their wedding is to see great wedding photos that captured their wedding day. Fairy Tale Wedding Dresses – Check it out! Dubrovnik offers numerous wedding venues that will be a real challenge for wedding photographers as each wedding venue seems more magical than the next. There is only a few cities in the world that have collected such a wealth of glorious history in such a small spot, a spot that can be almost taken in at one glance. Dubrovnik old town scenery offers future married couples extraordinary surroundings for their most important life ceremony. One of the more spectacular architectural attractions among the many monumental structures that Dubrovnik has to offer. Sponza Palace is one of the most inspiring designs from the famed renaissance architect Paskoje Milicevic. The Rector’s Palace is another grand building with beautiful arches. It was built in Gothic and Renaissance styles in the 15th century. If you would like to give a style to your most important day, consider this palace. It is a monumental and impressive fortress, outside the city walls at the western part of the city. It rises proudly on a steep cliff about 37 meters high with magnificent view on the old town. Its terrace is an ideal place for your wedding ceremony. Revelin is a large fortress, built outside the city walls in the eastern part of the city, next to the Ploce Gate. Together with Lovrijenac fortress was always mighty guard of Dubrovnik harbor. It’s unique venue for wedding ceremonies. For your wedding in Dubrovnik the Terrace of the Palms, is the most beautiful terrace in Dubrovnik, with an unforgettable view of the Old City. Palm Terrace is located within Hotel Excelsior – Dubrovnik. The terrace represents an ideal place for organizing all kinds of events and happenings from gala dinners, cocktail parties to the organization of the wedding ceremonies and honeymoon celebrations. The ever green island of romantic beauty, in the immediate vicinity of Dubrovnik is a real oasis of peace and one of the most charming venues for your most important day. Choosing Lokrum for your ceremony wedding in Dubrovnik, will leave deep impressions that cannot be forgotten. This island with the peaceful resorts and little bays, the fragrance of the sea, the pine wood, the rich sub-tropical vegetation, and old Benedictine monastery, will be the hottest wedding venue. Readers of the Conde Nast Travel magazine have recently pronounced the popular restaurant Nautika in Dubrovnik, one of the 12 most romantic restaurants in the world. The celebrated restaurant Nautika is situated in Pile, at the very entrance to the Dubrovnik Old Town. Besides of its exquisite food menu and an extensive wine list, the best feature of this restaurant is undoubtedly, the location. Its terrace provides a unique view of Dubrovnik’s landmarks the Lovrijenac and Bokar forts, which makes it the perfect venue for wedding in Dubrovnik. Find out more about Dubrovnik’s walls and fortresses! Before planning your wedding in Dubrovnik or in any other Croatia’s destination (Hvar, Split, Korcula) you need some marriage documents and my advice would be that you first call the register office where you want to get married, and ask them which documents they will require from you and your partner. These offices are called ‘Maticni Ured’ and you can find than almost in every town in Croatia. If you need more help how to confront all the aspects of your wedding planning in Dubrovnik, I suggest you to consult one of the local wedding agencies. 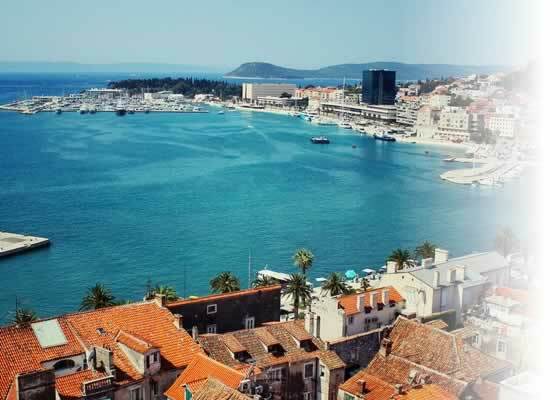 DoYouWed.Me – Dubrovnik wedding planning agency focused on organizing destination weddings for couples arriving in Croatia from around the world. Dubrovnik Luxury Weddings – a wedding planning agency of young team, experienced wedding planners, that will turn your wedding day in the stunning and romantic city of Dubrovnik unforgettable! Yes I Du – wedding agency provides services in Dubrovnik and Zagreb. They offer personalized custom wedding in Dubrovnik, as a unique, exceptional little pieces of art, collaborating with a team of top professionals and artists. Wedding D’inspiration agency – This is where you can get a wide range of services from locating the venue to guiding you through all procedural necessities so that you can relax and focus on more important matters like the dress and the honeymoon. If you’re like to share your experiences with any wedding agencies in Dubrovnik, or want to share your amazing wedding photos be sure to contact me!